Have you been baking along with Great British Bake Off this year? Want to know how to photograph your bakes at their very best? We’ve talked a little about baking photography tips on the blog before. And, as we’re big fans of both making and eating cake, we thought we’d share a few more tips on the blog with you today. That way, if you happen to produce a Showstopper worthy of Star Baker or indeed, a Hollywood handshake, you can also be a little more confident in capturing your efforts to put on canvas. A series of cake photos would look lovely on the wall above the breakfast table, don’t you think? When and why do you bake? Are you an early riser who likes to take advantage of a quiet kitchen or is it a final task to relax you before you head off to bed? Thinking about the levels of natural light available at the time many not be your first consideration when the baking mood take you but too much flash can ruin the best of bakes. And while overhead lights can be super handy for seeing what you’re doing, they’re not great for cake photography. Ideally, you want to use natural light, so if you happen to like baking around golden hour, that’s great news. If you’ve plenty of light you can use a faster shutter speed, otherwise, keep it slow and use a tripod to steady. How fancy is your kitchen? Are your benches and tiled splash backs really the best setting for the food styling you aspire to? Like our baking, we all have our own styling preferences. Start with the basics like photographing cakes, delicious tray bakes and frosting laden cupcakes from different angles and in varying arrangements. Cut slices, photograph from the top to show your decoration skills, stack or arrange in lines. Setting against a white background can help to bring in plenty of light. However, many cake photographers like to bring in colour with patterned backgrounds and to frame with pops of colourful ingredients or utensils. The say you eat with your eyes first and in the very best food photography, you should almost be able to taste and smell the thing you’re looking at. Many photographers use ingredients arranged on and around cakes and bakes to hint at flavours or build an overall colour scheme. Suggested movement is another popular technique. A jug of salted caramel sauce being poured slowly over chocolate brownies or a close up of a face enjoying that very first mouthful of a messy pavlova – think about how you’ll involve the viewer in the scene. 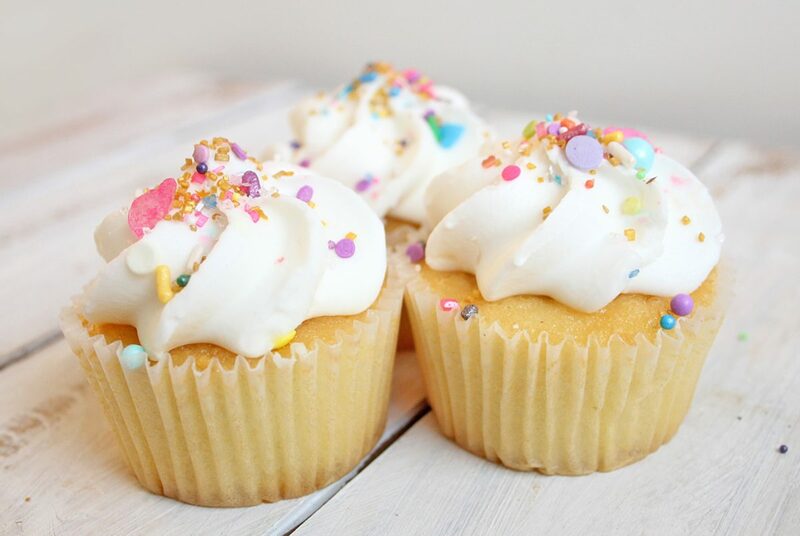 If you’re photographing cupcakes or biscuits for your own baking business, make sure you let potential customers see inside those neat little cupcake boxes. Don’t just snap the packaging, pop open the box and put one of your finest examples next to a beautiful brew – create your own ‘mmmm’ moment. Love the idea of making more of what you create in the kitchen, you may want to check out our product photography and tips for getting into food photography posts too.